This week David looks at your final training sessions before the big day. The countdown is on to the biggest sporting event of the year. 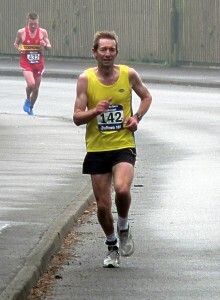 No, not the Olympics but the Mulberry Bush Montessori Balfron 10k which is fast approaching. In order to be ready for the big race you need to be thinking ahead and planning your training sessions so you are in the best possible shape for lining up with the rest of the runners on Sunday, April 24. The most common approach at this stage would be to gradually increase your training in distance and speed until the last week of the race then you ease it down or taper. For the two next weeks try gradually increasing the time or distance of your long run. Also aim to do two or three quality or specific harder sessions. An example of a week’s training could look like something this: Sunday: a longer run at an easy, steady pace. Monday: could be a rest day or easy run. Tuesday: your first quality session, for example (6 x 3 minutes with 2 jog recoveries between efforts). Wednesday: could be a rest day, easy run or cross training such as a swim. Thursday: quality session number two such as a steady hard run of 20-40 minutes at a speed that is slower than your 10k pace by about 20 seconds per kilometre. Friday: another easy or rest day. Saturday: could be your third quality session for example ( 6-12 x 400m with 2 minute jog recovery in between). Saturday: why not tackle a longer effort such as a 5k or Parkrun? Remember on those easy days you could always add in a few faster 100m strides as well. Always warm up well before the quality sessions and cool down afterwards with a easy jog. This is only one example of a weekly training session and can be adapted for different levels. Often running sessions concentrating on time rather than distance works with a mixed group. If time is an issue cut one quality session but try and do 2-4 runs a week. I hope this is of some help in keeping you focused as the big race date looms. Keep at it and I hope you are already beginning to feel the benefits of running and want to continue long after the Balfron 10k is over. Next week I will talk about that all-important race preparation.